Looking to drive more online traffic to your law firm? Using SEO (search engine optimization) to get your firm’s website to the top of Google is one of the best ways to drive traffic to your business. If you’re looking to hire an attorney SEO expert to do legal SEO for you, then we’d love to give you a free personalized SEO strategy review. If you’re looking to do the SEO yourself, this comprehensive guide will give you the tips and strategies you need to get started. When you need a good or service, such as a lawyer or dentist, how do you find it? If you’re like most Americans, you search on Google. When you search for something on Google, where do people typically click? Think about it, where do you click? Usually on page 1 and on the first or second search result. The top organic (non-paid) search result gets almost 30% of the clicks, according to a study by Advanced Web Ranking. By comparison, the number 2 spot gets just 14% of the clicks and the top result on page 2 gets just 1% of the clicks. So, in lawyer SEO, not only is it incredibly important to be on page 1 of Google, but getting that top spot is even more important. With SEO becoming more and more competitive in the US, attorney SEO is even more so. Many law firms know how important it is to get to the top of Google in SEO, so you need to be on your game. 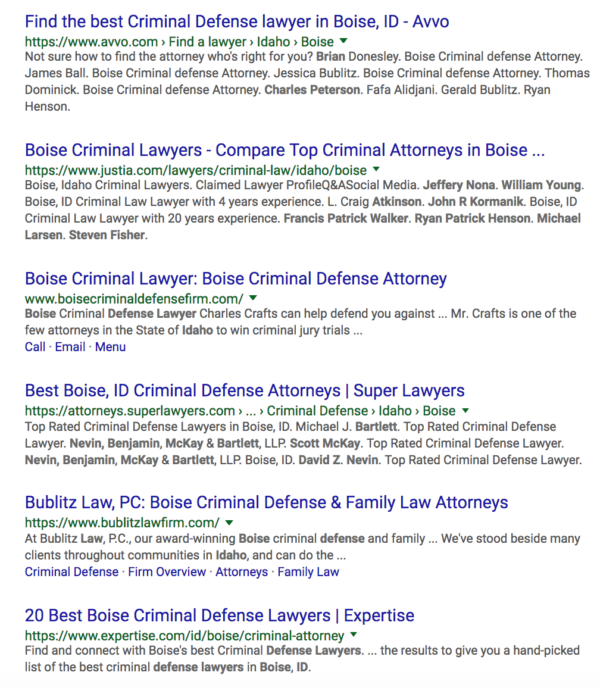 If you search “defense attorney boise idaho”, the top two results, and 5 out of the top 10, are aggregator sites like Avvo and Yelp. That leaves you with just 25% of the SERP to work with. And if you aren’t getting those top two spots, you most likely won’t be getting a majority of the clicks either. While working to get your website to rank above those sites is a noble endeavor, it’s also very difficult. These websites are usually at the top of the SERP and for a variety of legal terms. That’s why we at Sure Oak propose a different strategy; If you can’t beat em, join em! Use the aggregator websites to your advantage. While improving your website’s search ranking is a must in lawyer SEO, listing your firm on aggregator sites like Avvo, Justia, and Findlaw can massively improve your organic search presence. Be sure to optimize your profile on these sites for the search terms you’d like to rank for on Google. Let’s stick with the search example above. If you’re a defense attorney in Boise, Idaho, put that in your profile. When you’re looking for an attorney SEO expert, pay attention to the strategy they propose and what’s included. Does their proposal mainly focus on ranking above the aggregator sites mentioned above? Or do they plan to leverage those sites to give your business more visibility on the SERP? You want a strategy that uses those sites to your advantage instead of just trying to outrank them. While taking advantage of aggregator sites is super smart, it would be foolish to stop there. You need to optimize your website for users and search engines as well. That all starts with solid keyword research. I can’t emphasize enough how important keyword research is in legal SEO. Trying to rank for legal search terms isn’t enough. Your website and profiles on aggregator sites need to rank for the right keywords. Awareness – Looking to get information for their case. This is the top of the funnel. Research – Trying to learn more about the services you offer. This is the middle of the funnel. Buy – Seriously considering buying your services. This is the bottom of the funnel. Ranking for the keywords with the highest buyer-intent is the ultimate goal. But you can and should do better than that. You can rank for each phase of their search. Because the competition is so high in lawyer SEO, you need to be on top of your game. That especially applies to keyword research. We’ll teach you how to determine which keywords are the best for your SEO strategy and the tools to help you find them. Don’t be intimidated. The tools do most of the research for you. There are lots of great keyword research tools out there. If you’re on a strapped-budget, try using the Google Ads Keyword Planner tool. It’s completely free and a great tool. If you’re willing to pay a little, check out SEMrush. Don’t just try to rank for keywords with the highest search volume, because oftentimes those won’t be the high-converting keywords. If you’re simply trying to rank for high-volume keywords, you will waste a lot of time and your law practice will suffer. Keywords with a high CPC (Cost Per Click). CPC is for paid search but it applies to organic search as well. For example, in lawyer SEO, the keyword “employment lawyer” in Boise, ID has a CPC of over $8. “Wrongful termination” only has a CPC of $1.85. So, you’d want to target employment lawyer because it’s much more likely to convert. Go after keywords with high volume. This is pretty intuitive because the more a keyword is searched means ranking for that keyword will bring more people to your website. Keywords with low competition. This means the keyword is easier to rank for. The ideal keywords will have all three of those. You can see all of those things mentioned above in Google Ads Keyword Planner and SEMrush. But it can be a pain and take a lot of time to do it that way. However, if you put your URL into SEMrush, it will show you your closest competitors and the keywords they’re buying in paid ads and organically ranking for on Google. Never assume that because one of your competitors is ranking for certain keywords that you should just go after those same ones. Put some of your other competitors’ URLs into SEMrush to make sure those are the keywords you should target. That will save you a lot of time. You can also use SEMrush and another tool called Ahrefs to fill in gaps in your content. You simply go to one of these tools, type in your URL and your competitors’, and they’ll tell you which keywords your competitors are ranking for, that you aren’t. SEMrush and Ahrefs will automatically update your lists of keywords as your competitors change. Who’s ranking for certain keywords varies over time, so they update the information for you. That way you don’t have to manually go in and refresh your keywords. Knowing the keywords you need to rank for, and where they are in the searcher’s journey, will help you structure your website accordingly and create the right kind of content. Having a website that is well-structured will help you rank higher on Google and increase your conversion rates. Conversely, if your website is difficult to use and poorly optimized, trying to rank on page 1 of Google will be like trying to push water up a hill. It’s common for websites to have one page that describes every service the attorney or firm offers. Avoid this at all costs. While it may be faster to have one services page, it will be almost impossible to get it to rank for any of the terms you’re targeting. Think about it, a page that attempts to rank for 10 different keywords, with just a few lines on each topic, won’t have enough content for Google to say it’s authoritative on that subject. Instead, build a page for each individual service you offer. Have separate pages that go in-depth on niche legal services you provide. Your homepage shouldn’t be the only page that attempts to rank for keywords. Each page can catch the attention of someone searching for that service. Notice how this website, which ranks at the number 3 spot on the SERP, has a top-level navigation item called Practice Areas and a page for each legal service the firm provides. Pay attention to the depth of each page as well. They’re all very specific. 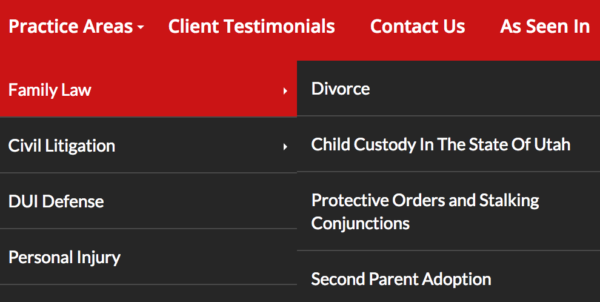 Whoever did the SEO for this firm knew that it wasn’t enough to simply have one page on family law and another on civil litigation. They built niche-specific pages for each service the firm offers in those categories. Now that you know you need to build a page for each service you offer, I’ll tell you how to optimize each page so that your users and Google will love them. If your website is built in WordPress, there’s a great SEO plugin called Yoast. Yoast will walk you through each step and let you know its readability and SEO score. Whether or not your website is on WordPress, here’s the ultimate lawyer SEO guide for page building. We’re not just looking for your firm’s competitors in general. Rather, we’re looking for who ranks at the top of Google on the SERP for the terms you need to rank for. You can easily find this out by searching for the keywords you want to target. Don’t blindly copy what they do. Look through their website and see if they’re optimizing it for Google. If they’re doing a good job, then you can take cues from what they’re doing. This also means you’ve got your work cut out for you, but don’t stress. Hiring a stellar agency with experience in lawyer SEO or following this guide will help you overtake them. If you comb through their website and it isn’t well-optimized, that’s great news for you! You can follow the steps below and overtake them on the SERP. 1Is there a lot of text on the page? Are there headings and subheadings on the page? Does the URL contain the targeted keyword or a close variant? Is the keyword in the title tag and meta description? Does the page contain links, both to pages on and off the website? Does the page load quickly? Is there a good call-to-action (CTA) on the page? Whatever they’re doing, if it applies to your strategy, do it better. One of the keys to lawyer SEO is authority. You can showcase your authority by showcasing your expertise. Each service page you build should have at least 300 words, preferably more like 500 or 600, and mention the targeted keyword several times. It’s not enough to have one or two sentences on the page about the service. It should be noted, however, that you don’t want to keyword stuff and have the targeted keyword on the page 40 times. Make sure it sounds natural, but also make sure you use that keyword more than one or two times. When looking at your competitors’ websites, hit “control + f” or “command f” on Macs, and type in the keyword. Take note of how much they use it. Is it a lot or a little? You can also use a word-counter to see how many words they’ve got on the page. Just copy the text on the page and paste it into the word-counter. This is all important because Google can read text but not images. So it’s important to explain the service you offer in-depth. And most importantly, the content needs to be custom. If you’re just copying and pasting content from somewhere else, Google will see that and won’t see it as authoritative or trustworthy. If your firm only serves local clients, create and claim your Google My Business listing ASAP. A major part of local SEO is how far the searcher is from your office. Also, make sure your firm’s name, address, and phone number (NAP) are exactly the same on all of your business listings. Your NAP should be the same on AVVO, Findlaw, and Justia as on Google My Business. When optimizing for local search, be sure to include the city you’re located in and local landmarks throughout your pages and URLs. In a local lawyer SEO strategy, you need to show Google where your website is. If you have multiple locations, you should create a Google My Business listing for each one. In a national lawyer SEO strategy, you don’t need local listings like Google My Business. National law firms don’t go after a certain geographical area. If your firm serves clients anywhere in the country, leave out geographical terms and just go after keywords relevant to your website and practice. Whether your firm serves local or national clients, reviews are important. They show potential clients if they can trust you to do a good job or not. But Google looks at reviews as well. For example, if you had 10 people tell you a law firm was pretty good to work with and did a pretty good job, you might want to use that firm. But if you had a firm that was recommended to you by 50 people who all raved about how great it was, which one would you choose? Google looks at this the same way and gives the website with more good reviews a higher ranking. It should also be noted that you should respond to 100% of the negative reviews you get. Not only do searchers look at the negative reviews but they also want to see if and how they were responded to. If someone, a former client or not, leaves you a negative review, respond so everyone can see it. People and Google need to see that you tried to make things right in a respectful way. Does the legal SEO agency you’re considering have good reviews? How do they respond to negative reviews? When you’re putting text on each page, be sure to add headings, such as h1, h2, and h3. Google reads headings and favors pages that have a good structure. Think of headings like chapters and sub-chapters in a book. Without them, the book would have no breaks, its readability would suffer and reading it would seem daunting. Headings work the same way. They break up the text and make it easy for the reader and Google. H1 – This is essentially the title of the page. Each page should only have one. This goes at the top of the page, or close to, and briefly tells the reader what the page is about. H2 – These are like chapter or section headings. A page can have multiple H2 that explain what that section is about. H3 – Think of H3s like a sub-section in a chapter. You can use these multiple times on a page to further drill down into a top. Having the URL match the page you built is also very important. Websites optimized for users and Google will have the targeted keyword in the URL. It should also follow the structure of the navigation. Having a URL that says something like “page 1” or “service 1” for a page about employment law will hurt you. This is one of the most fundamental elements to lawyer SEO and SEO in general. Title tags explain to Google and the user what your page is about on the SERP. Think of title tags as names on folders. They tell Google and users what’s inside the file. When you’re crafting title tags, make sure you include the targeted keyword at the beginning. You only get about 60 characters before Google truncates the title tag, so it needs to be short and concise. The meta description is what shows up as a small paragraph of text for each website on the SERP. It describes to Google and searchers what the page is about in 160 characters or less. The blue text at the top is the title tag, and the paragraph of text under the URL is the meta description. Notice that the keywords we searched for are in both the title tag and meta description. When writing your meta descriptions, be sure to include your targeted keywords. If you link to pages within your website multiple times, it shows that you believe that page is worth something. Google takes notice of this and says that if you believe this page is important, it might give it a boost in organic search rankings. On the flip side, if you won’t even link to a page within your own website, you’re showing Google you don’t think it’s a great page. If you don’t view it highly, Google won’t either. A word of caution here: be careful not to link to the same page within your website too many times. If you link to the same page 500 times, Google will think it’s spam. Linking to pages on other websites can give your page a boost too. When you do this, it shows Google that you got your information from somewhere trustworthy, so Google will give it more relevance. So much of lawyer SEO is about trust. And if your pages load quickly, people are more likely to stay on your website. If they take 10 seconds to load, people will bounce. The more that happens, the more Google sees it as a bad experience where people aren’t getting what they need. So they move your website down in the rankings. As a result, Google will send less and less traffic to your website. You can test the load speed of pages on your site and your competitors’ with Google’s Pagespeed Insights. Simply plug in the URL of the page you want to test and Google will give you a score of how fast or slow it is, and a list of what’s slowing it down. Don’t let good be the enemy of the best here. While decreasing the file size of your images can make a huge difference, look at the other optimizations as well. See what you can do to make your website and each individual page you build load faster. As I mentioned earlier, it isn’t enough to simply send traffic to your website. If your organic search views went from 10 views a month to 1,000 but none of them were contacting you for your legal services, wouldn’t that seem like a total waste? Traffic increases need to result in more business for your firm. it isn’t enough to have amazing content on a page optimized to the nines if you don’t have the proper CTA. Legal websites that haven’t been optimized to convert will slap a form on the bottom of a page that says “Contact Us” and expect people to fill it out. Then they’ll be surprised and frustrated when their increased traffic isn’t turning into clients. Asking people to contact you will only get your about 1/30 leads. Just because someone is on your website doesn’t mean they’re ready and excited to hire you. A contact form that would have a much higher conversion rate would say something like “Get Free Consultation.” You can also optimize the form for the page it’s on. For example, if your law firm has a webpage on DUI defense, put that in the form title. Have it read something like “Get Free DUI Defense Consultation” so it’s more relevant to the potential client. Invite them to take the next step in their decision to find a lawyer. A good lawyer SEO agency will do the same thing. They will offer something of value to you for free. A good example is a free personalized SEO strategy review like the one we offer at Sure Oak. If the agency just has a form saying “Contact Us” they probably aren’t the best to go with. Once you’ve optimized your website with user and Google-friendly niche-specific pages, the next step is to start producing killer content. I’m not talking about the content on your pages here. Hopefully, you’ve already done that by following the steps above. This is about getting people to see you as an expert in your legal field and attract more people to your website. The best thing to do here is blog. If your website doesn’t have a blog, add one. You can start with one blog post per week. Video and audio content are great too, but Google doesn’t give them as much credence as it does with text-based content. However, these can be great, for user-engagement so it can definitely still be worth doing. What is Stellar Lawyer SEO Content? Knowing you need to produce great content is one thing, but how do you do it? What does it consist of? Write in conversational tones. It’s more engaging, and searchers would rather read content that’s engaging instead of something boring like a textbook. Make it long. Google likes content that’s long and in-depth because it’s more useful to the searcher. So stay away from writing blog posts that are 500 words. Instead, your blog posts should have a minimum of 1,000 words, and 2,000 or 3,000 words would be even better. They just can’t be short. Use subheadings. They make it easier to read and digest, just like on your page content. Write in short paragraphs. Try to keep each paragraph at six lines or less. It’s less overwhelming to read and makes them easier to skim through. Include images, audio, and video clips. Images are the most important here because they break up your blog post and make it easier to read. Video and audio clips are great too because they keep people’s attention and increase time spent on your website. For the most part, Google views people spending more time on your site as more engaging. Always, always, always end with a conclusion. And it’s actually smart to label it “conclusion” because people frequently scroll to the bottom of the page and then back to the top. Ask a question at the end of your conclusion. This will get more people to interact with your blog post by making comments, subscribing to your newsletter, and share your blog post on social media. Keep in mind that you have to respond to their comments or you look rude and impersonal. Is the lawyer SEO expert you’re considering producing useful, in-depth content? Now that you know what great attorney SEO content consists of, you might be wondering how to come up with blog post ideas. Don’t worry, it isn’t difficult. There’s a great tool called Answer The Public that shows you all the questions people are asking about a certain topic. Simply type in the subject and it will spit out a bunch of questions people are asking about it. For example, if you search “dui attorney” on Answer The Public, you’ll see a list of questions people ask on Google about that search term. You’d see that one of the questions people ask is “how to choose dui attorney”. You could write a blog post answering that exact question in a 1,000 to 2,000-word blog post or page on your website. You can save yourself a lot of time by using SEMrush in this situation. Here you can see what blog posts your competition has created that has received lots of views. Take those blog posts and make greater, more in-depth content on the same subject. For example, let’s say one of your competitors wrote a 1,000-word blog post a year ago called “10 Tips to Choose A DUI Attorney” that got a lot of traffic on Google. You could write a 2,000-word blog post titled “20 Tips to Choosing a Great DUI Attorney”. Obviously, your content has to be better and more in-depth than theirs. Getting links to your website is huge in lawyer SEO. Nothing will bring more organic search traffic to your website than quality, relevant backlinks. Backlinks are like referrals and recommendations to your website. When Google sees that lots of quality websites dealing with law are linking to your website, it takes that to mean that your website is a good place to send people to. What is a Relevant Backlink? While backlinks are incredibly important, they need to be in your field. For instance, getting a bunch of random websites that have nothing to do with anything legal to link to your website won’t carry much weight. Getting backlinks from websites in the legal field, on the other hand, will carry a lot more weight with Google. The aggregator sites mentioned above will help as backlinks because they’re in the lawyer SEO field. They’re trusted websites, and they should send some traffic to your website. However, they won’t massively improve your organic search ranking overnight. Social media links don’t directly affect your SEO, but the more your content gets shared, viewed and interacted with on social media, the more traffic you’ll have coming to your website. This shows Google that your site is high-quality and deserves a higher ranking. There’s a great tool called Buzzsumo that will help you tremendously here. Just type in the keywords you’re targeting and it will show you everyone who shared your competitors’ blog posts. Once you’ve created an even better, more in-depth post, you can reach out to these people and ask them to share your post. Remember your blog post called “20 Tips to Choosing a DUI Attorney”? Now you can reach out to these people saying you saw they shared a previous post on how to choose a DUI attorney and that yours is more in-depth because it covers X, Y, and Z. Are the pages on their website optimized with title tags, meta descriptions, headings, and internal links? Does their website load quickly or is it slow? What do their reviews look like? Are they good for the most part? How do they handle bad reviews? Does the agency produce really solid content in the form of a blog post? Do the posts contain images, audio, and video? Are they making outlandish promises for a ridiculously low price? ie ranking at the top of page 1 within a month for $500 a month? Do their contact forms offer something of value? If the agency isn’t doing these things, or is making outlandish promises, you probably don’t want them doing SEO for your law firm. We at Sure Oak have a lot of experience doing SEO for law firms and attorneys, and we hope you’ll give us a chance. If you’re interested in having an agency do your legal SEO, we’ll give you a free personalized SEO strategy review. There’s no commitment at all. If you decide you’d rather take the strategy we’ve laid out above and do it yourself, that’s great too, and we wish you luck!